Solana Beach, CA – Rokenbok Education launched a Kickstarter campaign today for the ROKduino Programmable Robotics Set. The set comes with step-by-step instructions to build and program a beetle bot, a scorpion hunter and an auto-Ferris Wheel. With over 400 building components, including sensors, motor modules, hinges, wheels and gears – and a brand new Arduino-based smart block – imagination is the only limit to what children can build. The heart of this robotics set is the new ROKduino smart block. After building their creation with Rokenbok building components, children plug the ROKduino into a computer and start coding. 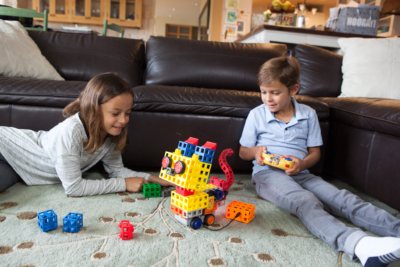 With Rokenbok’s step-by-step instructions and drag-and-drop programming, kids as young as eight years old can enjoy the satisfaction of bringing their robots to life. After mastering the basics, it’s a snap to step into full Arduino programming. Rokenbok will supply code blocks that can be downloaded from their site, but users are also free to use code from anywhere in the Arduino community. The microcontroller in the ROKduino smart block is an ATmega32U4, which is the same chip used in the Arduino Leonardo. Everything included in the robotics set, including the ROKduino, can snap into every building component Rokenbok has ever produced. Plus, Rokenbok will be providing downloadable CAD files for 3D printers, so families will be able to create their own custom components. The Rokenbok Programmable Robotics Set will retail for $300, but will go for $249 during the Kickstarter campaign and as little as $175 for the first fifty backers.